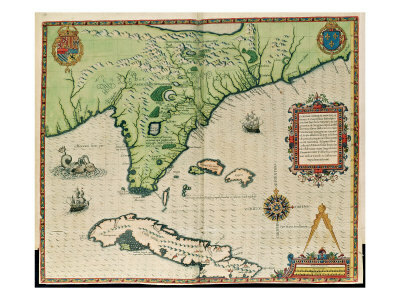 AN ARTIST WHO ACCOMPANIED THE FRENCH EXPEDITION TO FLORIDA UNDER LAUDONNIERE, 1564. 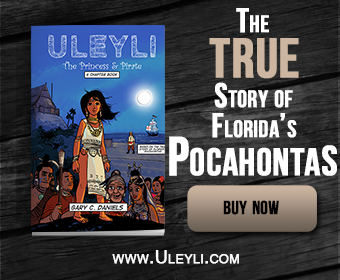 The Spaniards, having made several disastrous expeditions into Florida, had left it for a time unmolested. The French Protestants, attempting to colonize under Ribaud, built Charlefort at Port Royal in 1562, and Fort Caroline under Laudonniere, at the River May (now St. John’s, Florida), in 1564. The former was abandoned, leaving no traces but a few French names, which still designate the spot ; the latter, exciting the jealousy and religious indignation of the Spaniards (for the two nations were at peace), was assaulted and taken by them under Menendez, who afterwards founded St. Augustine, somewhat farther south. These heliotypes are copies of engravings from original drawings by Le Moyne, surnamed Le Morgues, sent by the French Government to accompany the Huguenot expedition under Laudonniere. Having’escaped the massacre by the Spaniards at Fort Caroline, the artist lived for a time in England, where he died ; and his widow sold his manuscripts and drawings to De Bry. Hakluyt having long ago published an English translation of the relations of Ribaud and Laudonniere, it would seem superfluous to reproduce them here. The drawings are worth perusal from the information they give of the habits of the aborigines three hundred years ago, as well as the arms and costumes of the Europeans of the same period, and give sufficient evidence that the artist visited the country. For instance, no one not familiar with alligators could have represented them with so much accuracy, though in the lapse of three hundred years they appear to have deteriorated in size.